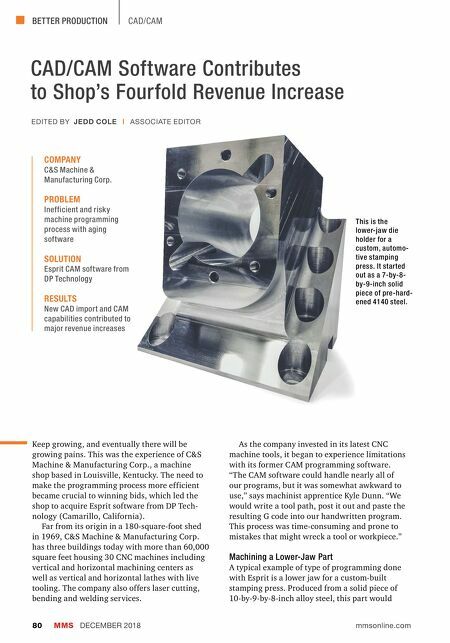 BETTER PRODUCTION MMS DECEMBER 2018 80 mmsonline.com CAD/CAM CAD/CAM Software Contributes to Shop's Fourfold Revenue Increase Keep growing, and eventually there will be growing pains. This was the experience of C&S Machine & Manufacturing Corp., a machine shop based in Louisville, Kentucky. The need to make the programming process more efficient became crucial to winning bids, which led the shop to acquire Esprit software from DP Tech- nology (Camarillo, California). Far from its origin in a 180-square-foot shed in 1969, C&S Machine & Manufacturing Corp. has three buildings today with more than 60,000 square feet housing 30 CNC machines including vertical and horizontal machining centers as well as vertical and horizontal lathes with live tooling. The company also offers laser cutting, bending and welding services. COMPANY C&S Machine & Manufacturing Corp. 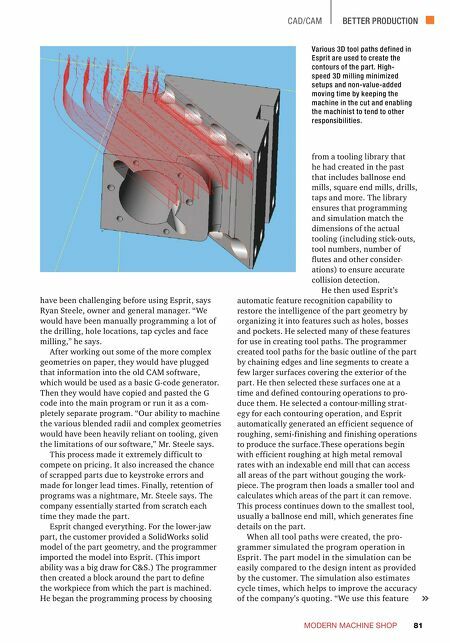 PROBLEM Inefficient and risky machine programming process with aging software SOLUTION Esprit CAM software from DP Technology RESULTS New CAD import and CAM capabilities contributed to major revenue increases EDITED BY JEDD COLE | ASSOCIATE EDITOR As the company invested in its latest CNC machine tools, it began to experience limitations with its former CAM programming software. "The CAM software could handle nearly all of our programs, but it was somewhat awkward to use," says machinist apprentice Kyle Dunn. "We would write a tool path, post it out and paste the resulting G code into our handwritten program. This process was time-consuming and prone to mistakes that might wreck a tool or workpiece." Machining a Lower-Jaw Part A typical example of type of programming done with Esprit is a lower jaw for a custom-built stamping press. Produced from a solid piece of 10-by-9-by-8-inch alloy steel, this part would This is the lower-jaw die holder for a custom, automo- tive stamping press. It started out as a 7-by-8- by-9-inch solid piece of pre-hard- ened 4140 steel.